Background: Primary repair of tetralogy of Fallot (TOF) has low surgical mortality, but some patients still experience significant postoperative morbidity. Aim: To review our institutional experience with primary TOF repair, and identify predictors of intensive care unit (ICU) morbidity. Settings and Design: Medium-sized pediatric cardiology program. Retrospective study. Subjects and Methods: We retrospectively reviewed all the patients with TOF and pulmonic stenosis who underwent primary repair in infancy at our institution from January 2001 to December 2012. Preoperative, operative, and postoperative demographic and morphologic data were analyzed. ICU morbidity was defined as prolonged ICU stay (≥7 days), and/or prolonged duration of mechanical ventilation (≥48 h). Statistical Analysis Used: Multiple logistic regression analysis. Results: Ninety-seven patients underwent primary surgical repair during the study period. The median age was 4.9 months (1-9 months) and the median weight was 5.3 kg (3.1-9.8 kg). There was no early surgical mortality. Incidence of junctional ectopic tachycardia (JET) and persistent complete heart block was 2 and 1%, respectively. The median length of ICU stay was 6 days (2-21 days) and median duration of mechanical ventilation was 19 h (0-136 h). By multiple regression analysis, age and weight were independent predictors of length of ICU stay, while surgical era was an independent predictor of duration of mechanical ventilation. Conclusion: Primary TOF repair is a safe procedure with low mortality and morbidity in a medium-sized program with outcomes comparable to national standards. Age and weight at the time of surgery remain significant predictors of morbidity. Tetralogy of Fallot (TOF) is the most common congenital cyanotic heart disease with an incidence of three per 10,000 live births, and accounts for about 5-7% of all congenital heart disease. From the time of first surgical palliation of TOF by Blalock and Taussig in 1945, surgical management has evolved to primary corrective repair that can safely be performed in all age groups. The safety of early primary repair is well-documented in the literature with several studies showing that it is a safe procedure even in neonate. As a result, primary repair of TOF is now a routine procedure with low surgical mortality rate of 0-2%. ,,,, Advocates of early primary repair believe that early relief of right ventricular outflow tract (RVOT) obstruction will prevent right ventricular hypertrophy (RVH) and dysfunction, as well as establish unobstructed pulmonary blood flow, which will encourage alveolar genesis. ,, However, data also clearly suggests an increased incidence of junctional ectopic tachycardia (JET), longer intensive care unit and hospital stays, more complicated recovery, and increased need for valve-sacrificing transannular patch repairs in patients who undergo primary repair in the neonatal period. ,,,, Some centers including ours perform neonatal repair when clinically indicated for severe RVOT obstruction, cyanosis, and hypercyanotic spells. In spite of low surgical mortality, intensive care unit (ICU) morbidity is relatively common after primary TOF repair. There is a strong correlation between ICU morbidity and intraoperative factors such as cardiopulmonary bypass (CPB) time, cross clamp, and surgical techniques. ,, However, our ability to identify patients at risk for significant ICU morbidity based on their preoperative characteristics is limited because of conflicting evidence in the literature. ,,, We hypothesized that certain preoperative demographic and morphologic characteristics increase risk of ICU morbidity after primary TOF repair. Following Institutional Review Board approval, all patients with diagnosis of TOF with pulmonic stenosis who underwent primary repair between January 2001 and December 2012 at Mount Sinai Hospital, New York were identified from the hospital database. We excluded patients who had a prior Blalock-Taussig shunt, patients who were older than 12 months of age at the time of repair, and patients with associated anatomic defects such as absent pulmonary valve syndrome, atrioventricular septal defect, or pulmonary atresia. Based on our inclusion criteria, we identified 99 patients within this study period. We divided the study period into early surgical era (January 2001-December 2006) and late surgical era (January 2007-December 2012) to evaluate the impact of evolving changes in surgical/anesthesia technique and perioperative management in the observed time period. The primary objective of this study was to determine overall survival and incidence of complications. Our secondary objective was to identify predictors of ICU morbidity which we defined as prolonged ICU stay and/or prolonged duration of mechanical ventilation. Based on published data in the literature, we defined prolonged ICU stay as length of ICU stay ≥7 days, and prolonged mechanical ventilation as duration of mechanical ventilation ≥48 h.
Demographic information evaluated included age at the time of surgery, gestational age, gender, weight, history of hypercyanotic spells, baseline systemic saturation, history of associated genetic disorders inclusive of Down syndrome, and presence of other extracardiac comorbidities. Echocardiographic data: Pulmonary valve annulus Z-score and main pulmonary artery Z-score as measures of RVOT obstruction. Operative data: The following were collected and analyzed - CPB time, aortic cross-clamp time, and presence of hemodynamically significant residual lesion on intraoperative transesophageal echocardiogram (TEE). We defined residual hemodynamic lesion as greater than trivial residual ventricular septal defect (VSD) or greater than trivial residual pulmonic stenosis (maximum instantaneous gradient of 20 mmHg). 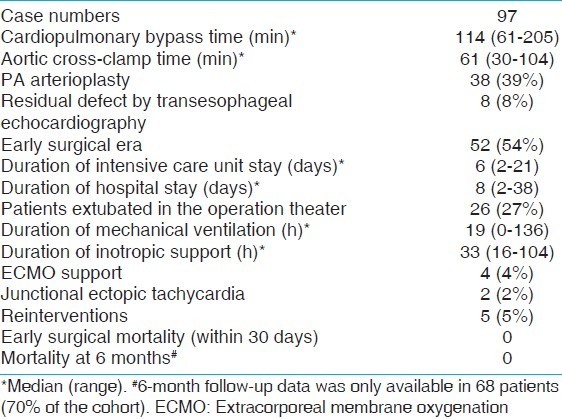 Postoperative ICU Data: Length of ICU stay, duration of mechanical ventilation, duration of inotropic support, postoperative arrhythmia such as JET, need for extracorporeal membrane oxygenation (ECMO) support, readmission within 30 days of surgery, and death within 30 days of surgery. Hemodynamic data and lab values collected and reviewed include; heart rate, central venous pressure, systemic arterial pressure (systolic, diastolic, and mean), serum lactate, blood gases, chemistry, and complete blood count (CBC). Standard descriptive statistic methods were used. Data were described as frequencies and median with ranges as appropriate. To assess differences between groups the Mann-Whitney's test or Student's test for continuous data and chi-square or Fisher's exact test for categorical data were used. Multiple logistic regression analysis was performed to determine independent risk factors of prolonged length of ICU stay and prolonged duration of mechanical ventilation. A P-value of <0.05 was considered statistically significant. All analyses were performed using Statistical Analysis Software (SAS) version 7 (SAS Institute, Inc., Cary, NC) with default settings except where indicated. Over the 12-year study period, 99 patients with TOF underwent primary repair in infancy in our institution. Two patients had incomplete hemodynamic data and were excluded from the study. [Table 1] shows the demographic and preoperative data of the study population. The median age at the time of surgery was 4.9 months (range: 1-9 months) and the median weight was 5.3 (range: 3.1-9.8 kg). There were 51 males and 46 females making up 53 and 47% of the study population, respectively. Twenty-six patients (26%) were premature (delivery prior to 37 completed weeks of gestation). Nine (9%) patients underwent TOF repair within the 1 st month of life. Eleven patients (11%) had Down syndrome, five patients (5%) had 22q11 deletion, and 19 patients (19%) had at least one episode of hypercyanotic spell prior to TOF repair. Median pulmonary valve Z-score for our population was -3.6 (range: -5.1 to -0.3) and 73 patients (75%) had pulmonary valve annular hypoplasia (pulmonary valve Z-score < -2). The median CPB time was 114 min (range: 61-205 min) and the median aortic cross-clamp time was 61 min (range: 30-104 min) [Table 2]. Intraoperative TEE showed residual hemodynamically insignificant lesions in eight patients (8%). These residual lesions were: Trivial/small residual VSD patch leak in five patients, mild residual RVOT obstruction in two patients, and small VSD patch leak plus mild RVOT obstruction in one patient; none of which required a repeat bypass run. Five patients (5%) underwent reintervention before hospital discharge. Four of these reinterventions were re-exploration for bleeding. One patient underwent placement of permanent epicardial pacemaker for persistent complete heart block. The median length of ICU stay was 6 days (range: 2-21 days), and median duration of mechanical ventilation was 19 h (range: 0-136 h). Four patients (4%) required ECMO support for hemodynamic instability and all four patients were successfully decanulated and survived to hospital discharge. Incidence of JET was 2% in this study period. All patients survived to hospital discharge and there was no early surgical mortality [Table 2]. Comparing surgical eras, there was a statistically significant decrease in duration of mechanical ventilation from the early surgical era (2001-2006) to the late surgical era (2007-2012), P-value: 0.01. The median duration of ventilation in the patients who were not extubated in the operating room (OR) decreased from 36 h (range: 0-112 min) in the early surgical era to 13 h (range: 0-136 h) in the late era. 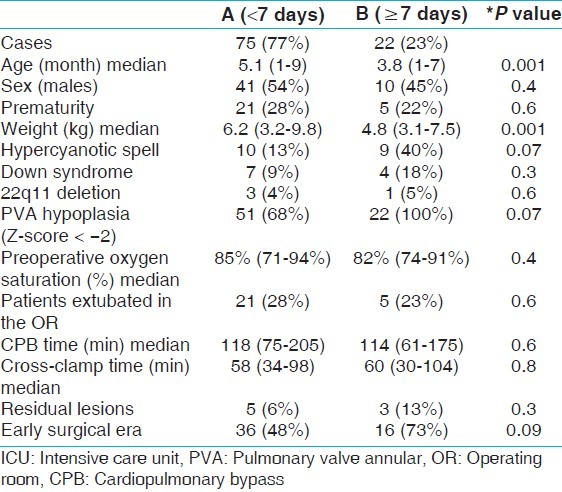 Apart from change in duration of mechanical ventilation, there was no significant difference in length of ICU stay, patient's demographics, surgical technique, intraoperative factors (CPB time and aortic cross-clamp time), and postoperative complications between the two surgical eras [Table 3]. Based on our definition of prolonged ICU stay (length of ICU stay ≥7days), 22 patients (23%) had prolonged ICU stay. These patients with prolonged ICU stay underwent surgical repair at a younger age (median: 3.8 months, range: 1-7 months) compared to patients with ICU stay <7 days (median: 5.1 months, range: 1-9 months), P-value 0.001. Also, there was a significant difference in the weight of patients with prolonged ICU stay (median 4.8 kg, range: 3.1-7.5 kg) compared to patients with length of ICU stay < 7 days (median 6.2 kg, range: 3.2-9.8 kg), P-value 0.001. Majority (73%) of the patients with prolonged ICU stay underwent TOF repair in the early surgical era compared to 48% of patients with ICU stay duration <7 days, P-value 0.02. Additionally, there was higher incidence of pulmonary valve annular hypoplasia in the patients with prolonged ICU stay compared to those with normal ICU stay duration (100 vs 68%, P-value: 0.002). However, on multivariate analysis, only age and weight at the time of surgery emerged as statistically significant predictors of prolonged ICU stay as shown in [Table 4]. 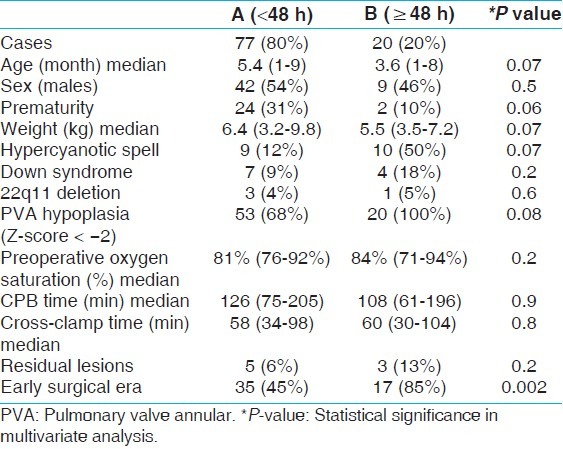 [Table 5] compares the preoperative and intraoperative characteristics of patient with prolonged duration of mechanical ventilation (≥48 h) to patients with duration of mechanical ventilation <48 h. Patients with prolonged duration of mechanical ventilation underwent surgical repair at a younger age (median: 3.6 months, range: 1-8 months) compared to patients with duration of mechanical ventilation <48 h (median: 5.4 months, range: 1-9 months), P-value 0.001. Also there was a significant difference in the weight of patients with prolonged duration of mechanical ventilation (media 5.5 kg, range: 3.5-7.2 kg) compared to patients with duration of mechanical ventilation <48 h (median 6.4 kg, range: 3.2-9.8 kg), P-value 0.001. Eighty-five percent (n = 17) of the patients with prolonged duration of mechanical ventilation underwent TOF repair in the early surgical era compared to 45% (n = 35) of patients with duration of mechanical ventilation <48 h, P-value 0.002. Additionally, there was higher incidence of pulmonary valve annular hypoplasia in the patients with prolonged duration of mechanical ventilation compared to those with duration of mechanical ventilation <48 h (100 vs 68%, P-value: 0.004). However on multivariate analysis, only surgical era reached statistical significance as a predictor of duration of mechanical ventilation. 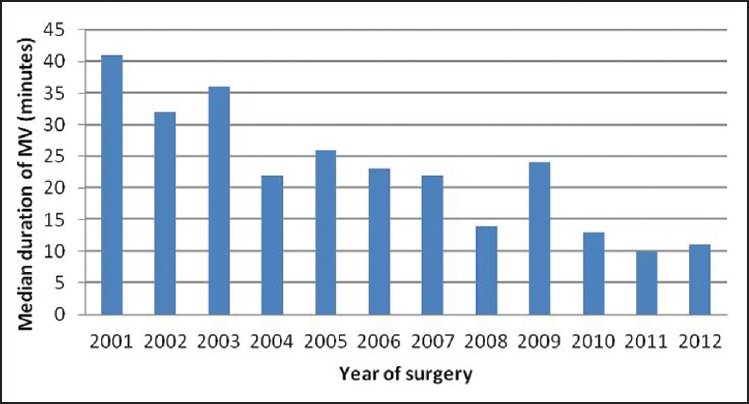 [Figure 1] shows the median duration of mechanical ventilation by year of surgery. From the first surgical palliation of TOF by Blalock and Taussig in 1945 and the first intracardiac repair of TOF using controlled cross-circulation by Lillehei et al., surgical management of TOF has evolved significantly over the years. The initial approach was surgical palliation with systemic-to-pulmonary shunt and subsequent intracardiac repair later in life. This approach resulted in myriads of complications such as distortion of pulmonary arteries, suboptimal development of pulmonary vasculature, shunt thrombosis, risk of pulmonary vascular diseases, end-organ dysfunction due to prolonged period of cyanosis, RVH and diastolic dysfunction which leads to arrhythmia and sudden death later in life. ,,, To avoid these complications, this initial two-stage approach evolved into primary repair in infancy. Primary repair of TOF is now the standard of care and has been safely applied to all age groups including neonates with low surgical mortality. In spite of low early surgical mortality after primary TOF repair, some patients still experience significant ICU morbidity. In order to assess preoperative risk factors for ICU morbidity, we reviewed our 12-year single center experience with primary TOF repair in infancy. Our series reported zero surgical mortality that compares favorably to that published in the literature. Knott-Craig et al., reported a decrease in surgical mortality after primary repair of TOF in all ages from 11% before 1990 to 2.1% after 1990. Two additional series by Reddy et al., and Touati et al., reported similar low mortality rate of 1-3% after primary repair with tendency for slightly higher mortality rates in neonates. , Nine of our patients (9%) underwent primary repair in neonatal period without any early mortality. Unfortunately, this number is too small to draw any reasonable inference from it. Unlike our study population which comprised of TOF with pulmonic stenosis only, Reddy et al., and Touati et al., included other extreme forms of TOF such as TOF with pulmonary atresia and TOF with absent pulmonary valve syndrome. , The anatomic complexity of their patient population must have contributed significantly to the slightly higher mortality in their study compared to ours. With regards to other postoperative morbidities in our series, one patient required placement of permanent epicardial pacemaker for complete heart block that persisted beyond 7 days postop, and two patients had JET that resolved with amiodarone yielding an incidence rate of 1 and 2% for complete heart block and JET, respectively. Our JET incidence rate appears lower than the incidence rate of 3-10% reported in the literature. ,, Batra et al., and Andreasen et al., reported incidence rate for JET after congenital heart surgery to be 8 and 10%, respectively. ,, These studies included lesion such as transposition of great arteries (TGA) with VSD and truncus arteriosus that involve intracardiac repair in neonatal period. Both studies also identified younger age (<1 month of age), longer CPB time, and inotropic score as risk factors for JET. The median duration of mechanical ventilation in our cohort during the entire study period was 19 h (range: 0-136 h). There was a significant decrease in the median duration of mechanical ventilation from 33 h in the first half of the study period (early surgical era), to 13 h in the second half of the study period (late surgical era). 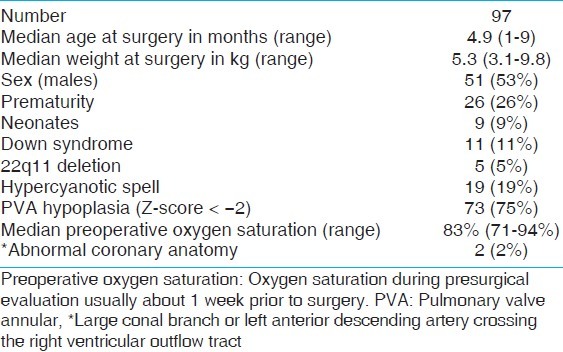 Modifications in perioperative care, such as surgical and anesthesia techniques, as well as postoperative sedation strategies contributed significantly to help decrease the overall duration of mechanical ventilation. Despite the decrease in duration of mechanical ventilation seen in the later time period, there was no significant change in length of ICU stay in this specific patient cohort. Our study had some limitations. First, the retrospective nature of the study and the lack of randomization made it susceptible to bias. Secondly, the low incidence of complications and the small number of patients with significant ICU morbidity (prolonged length of ICU stay and prolonged duration of mechanical ventilation) could have affected accuracy of statistical analysis for potential predictors of morbidity. Additionally there are a multitude of other variables associated with evolving perioperative management, variables associated with physician care givers and surgical expertise (despite the same surgeon throughout the course of this study) that can have an impact on outcomes especially length of ICU stay. Our institutional experience with primary repair of TOF in infancy demonstrates excellent outcomes with zero mortality and low morbidity which compares favorably with published data. Length of ICU stay was independent of associated chromosomal, extracardiac anomalies, gender, prematurity, morphologic surrogates of severity of TOF, cyanosis, and clinical symptoms. Surgical era had a direct impact on the duration of mechanical ventilation, while age and smaller weight at surgery were independent risk factors for prolonged ICU stay. We acknowledge the Mount Sinai Department of Cardiothoracic Surgery and Division of Pediatric Cardiology for granting us unlimited access to their surgical and Echolan database. We also thank Ugochi Egbe for her contribution during data mining, statistical analysis, and proofreading. 2. Lillehei CW, Cohen M, Warden HE, Read RC, Aust JB, Dewall RA, et al. Direct vision intracardiac surgical correction of the tetralogy of Fallot, pentalogy of Fallot, and pulmonary atresia defects; report of first ten cases. Ann Surg 1955;142:418-42. 3. Sousa Uva M, Lacour-Gayet F, Komiya T, Serraf A, Bruniaux J, Touchot A, et al. Surgery for tetralogy of Fallot at less than six months of age. J Thorac Cardiovasc Surg 1994;107:1291-300. 4. Di Donato RM, Jonas RA, Lang P, Rome JJ, Mayer JE Jr, Castaneda AR. Neonatal repair of tetralogy of Fallot with and without pulmonary atresia. J Thorac Cardiovasc Surg 1991;101:126-37. 5. Kolcz J, Pizarro C. Neonatal repair of tetralogy of Fallot results in improved pulmonary artery development without increased need for reintervention. Eur J Cardio-Thorac Surg 2005;28:394-9. 6. Reddy VM, Liddicoat JR, McElhinney DB, Brook MM, Stanger P, Hanley FL. Routine primary repair of tetralogy of Fallot in neonates and infants less than three months of age. Ann Thorac Surg 1995;60:S592-6. 7. Touati GD, Vouhe PR, Amodeo A, Pouard P, Mauriat P, Leca F, et al. Primary repair of tetralogy of Fallot in infancy. J Thorac Cardiovasc Surg 1990;99:396-402. 8. Gatzoulis MA, Balaji S, Webber SA, Siu SC, Hokanson JS, Poile C, et al. Risk factors for arrhythmia and sudden cardiac death late after repair of tetralogy of Fallot: A multicentre study. Lancet 2000;356:975-81. 9. Groh MA, Meliones JN, Bove EL, Kirklin JW, Blackstone EH, Lupinetti FM, et al. Repair of tetralogy of Fallot in infancy. Effect of pulmonary artery size on outcome. Circulation 1991;84:III206-12. 10. Walsh EP, Rockenmacher S, Keane JF, Hougen TJ, Lock JE, Castaneda AR. Late results in patients with tetralogy of Fallot repaired during infancy. Circulation 1988;77:1062-7. 11. Derby CD, Pizarro C. Routine primary repair of tetralogy of Fallot in the neonate. Exp Rev Cardiovasc Ther 2005;3:857-63. 12. Hirsch JC, Mosca RS, Bove EL. Complete repair of tetralogy of Fallot in the neonate: Results in the modern era. Ann Surg 2000;232:508-14. 13. van Dongen EI, Glansdorp AG, Mildner RJ, McCrindle BW, Sakopoulos AG, VanArsdell G, et al. The influence of perioperative factors on outcomes in children aged less than 18 months after repair of tetralogy of Fallot. J Thorac Cardiovasc Surg 2003;126:703-10. 14. Vobecky SJ, Williams WG, Trusler GA, Coles JG, Rebeyka IM, Smallhorn J, et al. Survival analysis of infants under age 18 months presenting with tetralogy of Fallot. Ann Thorac Surg 1993;56:944-9. 15. Knott-Craig CJ, Elkins RC, Lane MM, Holz J, McCue C, Ward KE. A 26-year experience with surgical management of tetralogy of Fallot: Risk analysis for mortality or late reintervention. Ann Thorac Surg 1998;66:506-11. 16. Makhoul M, Oster M, Fischbach P, Das S, Deshpande S. Junctional ectopic tachycardia after congenital heart surgery in the current surgical era. Pediatr Cardiol 2013;34:370-4. 17. Andreasen JB, Johnsen SP, Ravn HB. Junctional ectopic tachycardia after surgery for congenital heart disease in children. 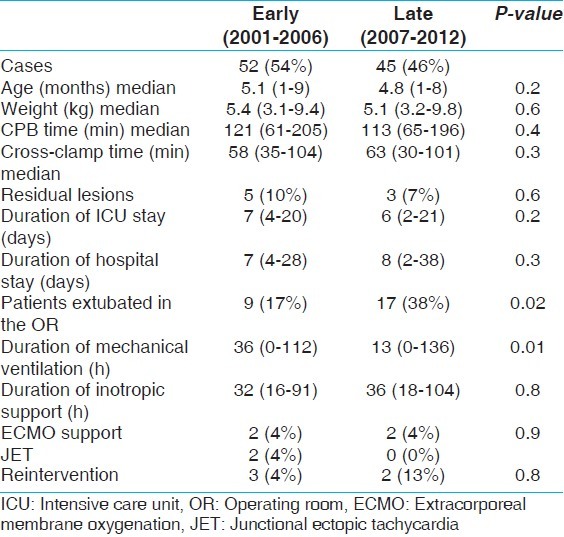 Intensive Care Med 2008;34:895-902. 18. Batra AS, Chun DS, Johnson TR, Maldonado EM, Kashyap BA, Maiers J, et al. A prospective analysis of the incidence and risk factors associated with junctional ectopic tachycardia following surgery for congenital heart disease. Pediatr Cardiol 2006;27:51-5. 19. Tamesberger MI, Lechner E, Mair R, Hofer A, Sames-Dolzer E, Tulzer G. Early primary repair of tetralogy of fallot in neonates and infants less than four months of age. Ann Thorac Surg 2008;86:1928-35. 20. Van Arsdell GS, Maharaj GS, Tom J, Rao VK, Coles JG, Freedom RM, et al. What is the optimal age for repair of tetralogy of Fallot? Circulation 2000;102:III123-9.